Looking for the best French food in downtown Vancouver? This might be it. Picture this: You’re on a rocky beach. You’re staring out at the Mediterranean sea when you realize it’s lunchtime. Being scantily clad in Nice, you’re naturally craving the light, local specialty: a Nicoise Salad. Fortunately, they’re sold all over town. 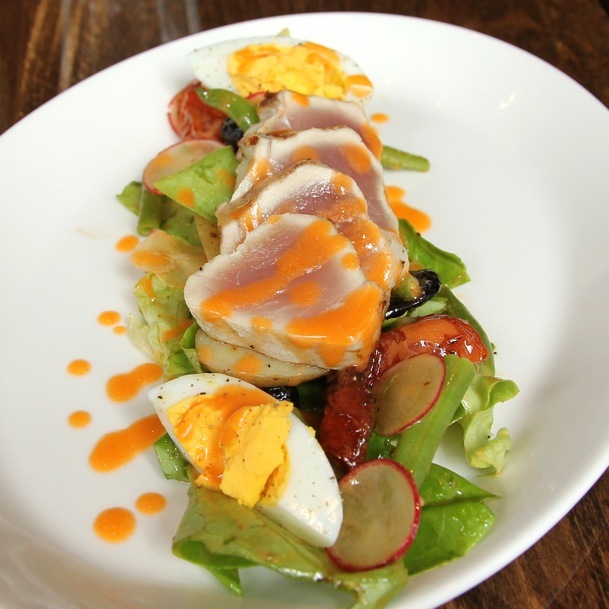 Cut to reality: You’re in Vancouver, it’s raining, but you’re still craving the Nicoise. Luckily, French-inspired Tableau Bar Bistro — straight out of a movie scene set in a posh hotel —just opened, and its take is better than the classic (made with canned tuna). Though small, this ‘snack’ is perfect for summer. The four ounces of seared Ocean Wise tuna topping the salad were fresh, flavourful, and artistically splashed with a great tomato pulp vinaigrette. Also delectable were the sun-dried tomatoes and olives. Standard elements of the Nicoise — hard-boiled egg, potatoes, and green beans — were plated with perfection.